Hello and welcome to a new Runway Inspired Challenge. To be honest, I was struggling with this outfit. I love the outfit. It was the pattern and the dark shades that got me. Combining patterns and darker colours together was a struggle. I almost gave up and asked Jen for more time to get a card done for this challenge. Just after I did that, I had a brain wave and made this card. Hennah Elements is one of my favourite stamp set from Altenew. That is because the images in this set are beautiful and the outline of these images are nice and thick. These images make a statement when stamped on coloured cardstock in black. So I stamped the images from Hennah Elements on a purple cardstock panel covering the entire panel. The panel was beautiful with the pattern which coordinated with the purple of the skirt from the outfit. 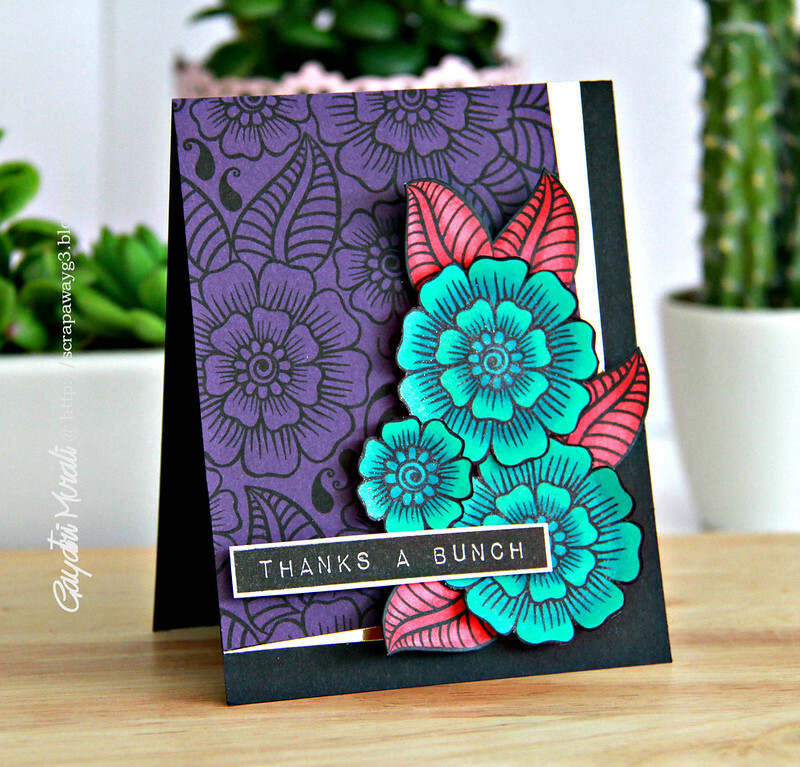 Then I stamped the large flower twice, small flower one and a few leaves on white card stock. I coloured using copic markers. The flowers in the teal blue and leaves in red. They were all cut out by hand. The base of the card is black. I adhered the purple panel at an angle with bits of gold foil cardstock sticking out on either side. Trimmed the excess off. The flowers and leaves are clustered and adhered using foam adhesives for dimension. I brushed shimmer on the flowers using Wink of Stella. The sentiment is from Label Love stamp set also from Altenew. Check out Runway Inspired Challenge blog for design team projects on this fabulous outfit. Come and play along with me. Wow Gayatri glad you stuck with it cause this card is sensational. 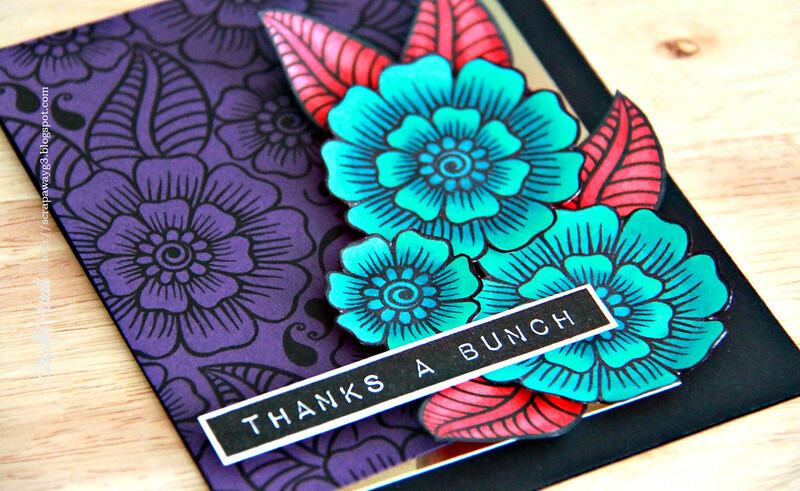 That's a tough inspiration pic but your combination of colours and elements and that divine stamp set are perfection. Wow, Gayatri! I love your brain wave idea!! This card is drop-dead GORGEOUS! One word…STUNNING (all caps and shouted out). Love your take on the color/design combo! So cohesive to keep the elements from the same set, and your colors are so rich!